Last weekend Flatland Gallery in Houston, Texas hosted the opening of Nicky Davis’ newest solo art show, “Sorting Something Out”. 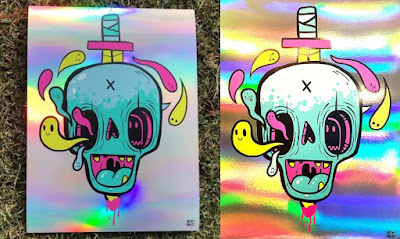 It is an exploration into the ghost covered, rainbow splashed underworld of artist Nicky’s imagination influenced from Saturday morning cartoons, graffiti covered walls, and long hikes through the wilderness. As Davis explained, “this body of work tries to make sense of what the hell it is that we are all doing here.” To commemorate the show’s opening night, Nicky Davis released this awesome “Sorting Something Out” holographic foil screen print. 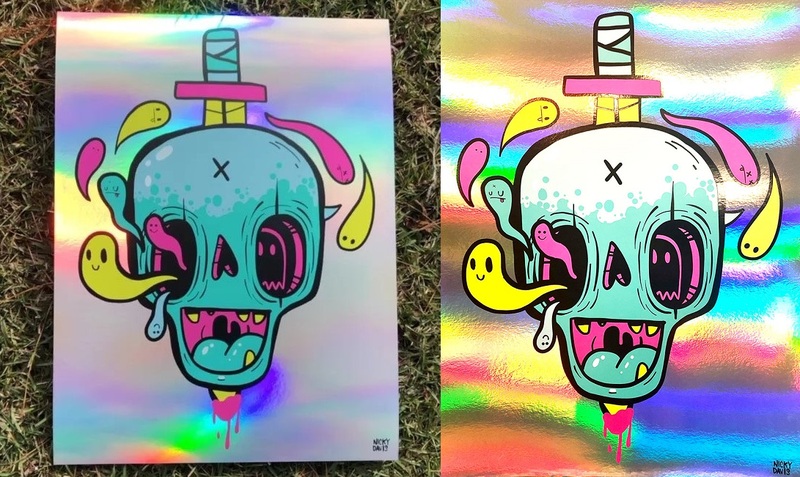 “Sorting Something Out” by Nicky Davis is an 18”x24” signed and numbered screen print on holographic foil paper. Limited to just 100 pieces, collectors can purchase this killer new poster now at the Nicky Davis online store for just $35.